So, Ferris decided to put her love of books on display – literally. 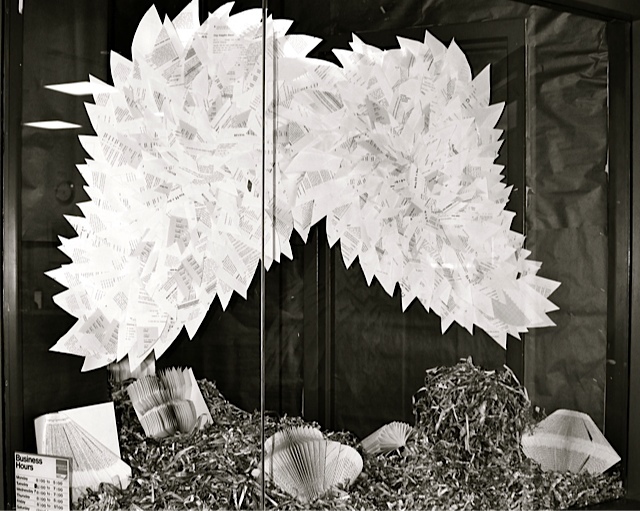 With the help of her staff, she created a one-of-a-kind window display, made almost entirely out of used textbooks. Because the store was in middle of a remodel, the staff members had some downtime and decided to bring Ferris’ idea to life. By incorporating the pre-made pieces from her holiday projects, they had a head start. That meant the only thing left to assemble in the store was the focal point of the display: bookish attire featured on a female mannequin. Although the display may look overwhelming, she insists it’s one that any store could complete. “All it takes is a little imagination and a lot of time!” she emphasized. 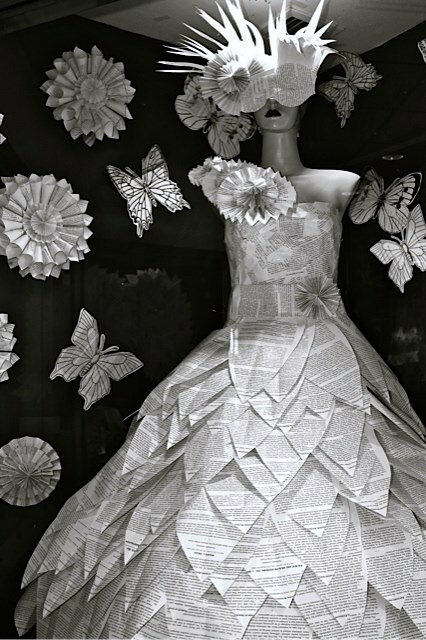 The dress itself was made from just one Cases and Materials Law Book, while the head piece required a few additional titles. All together, the project took staff members the better part of a day to complete, but they all agree it was worth the effort! Although the display was taken down a few months later, Ferris simply didn’t have the heart to throw it out. In fact, some of the pieces now hang from her office ceiling and others adorn the shelves. And, she hopes that a new book-inspired display will be front and center again soon.